I like the way it was introduced in small section so we could grasp it ok. I’ve never been to a singing workshop before – Loved It! Always a good day out – look forward to more, and seeing more performances. Thank you for all your hard work to make the day a success. The ‘feel good’ factor and a sense of achievement. A wonderful, musical, full of fun and laughter day. I loved it – came last year and really think I’m going to join this amazing group. Felt energised and tired, but very worthwhile. Great pointer – shoulder blades in back pockets. Loved the analogy of breath on a mirror. Reminded me how much fun singing can be, and a sense of achievement. Fun, and a little more confidence in my voice. Enjoyment of singing in a big chorus, with very friendly women. Excellent tips from the Director on getting right notes, etc. Excellent friendship! Good craft points. Great to sing with a 1st class group. I expected to sing Lead but found myself in Baritone which pushed me further than I’m used to. I must just say how wonderful all the ladies were and helpful with lots of kindness. Super day. I loved the word worksheets – worked like a charm. Another fantastic day – thanks to everyone involved. We loved and and will be coming next year. A great day, the breaks and refreshments just right – and thank you for our Gift Bag! Really good fun, thank you for all your hard work. Everyone friendly and warm. Felt very welcome. Great day – thank you! Very well organised. Everyone made to feel welcome, they were helpful, friendly and put me at ease quickly. Thank you. Very well organised, a pleasant day. You were all very welcoming and the instruction was excellent. 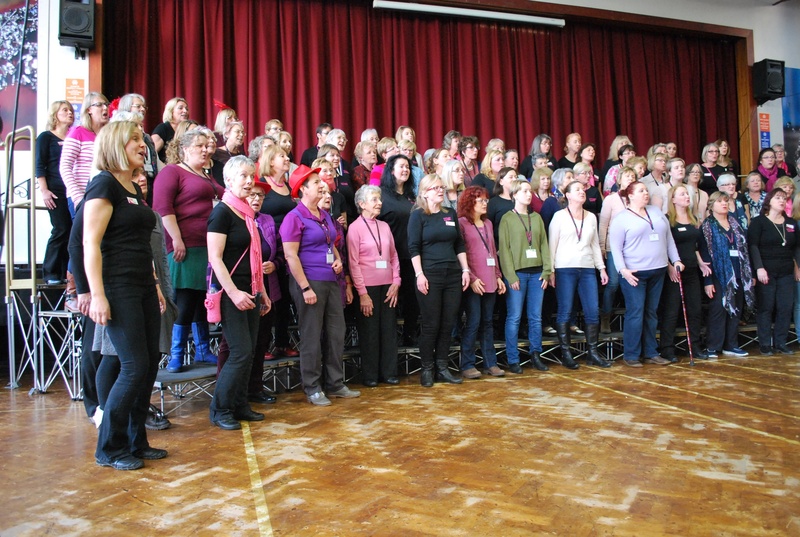 Thank you Fascinating Rhythm for making us your charity of choice for 2015 and then giving a concert at Beaudesert School, Minchinhampton on Saturday, 7th May 2016 to raise fund for Home-Start Stroud District. The new Hall at the school provided a perfect setting for the event. 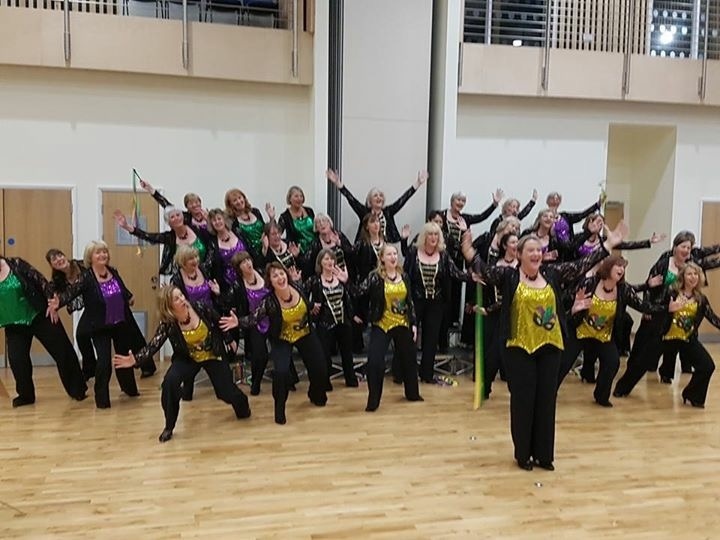 By the time the chorus took their place there were over 100 people in the audience and first impressions were of a smiling, alert, smartly dressed group who proceeded to give us a mixture of songs that showcased their talents. Each item was introduced with a light but informative few words which explained about the techniques that is required to sing without any backing music. Four parts is the basic method but we enjoyed one piece that had ten part harmony, hugely impressive to those of us who find singing alto a challenge! The impact of the song ‘Fix You’ was poignant as the words sum up much of the emotions behind many of the situations faced by our Home-Start families. For the writer it had the added impact that it was written by Chris Martin of Coldplay who, as a schoolboy, was one of my husband’s pupils! Thank you to everyone who gave up a Saturday evening, you raised £1,270. “Very good. Nice cakes! Thanks!! Do it again! Bouncing off the energy of FR and singing at the end. Double woo hoo! Everything – how to sing, how to listen, met you all and how lovely you all are. Fantastic and (in a Craig Revell-Horwood voice!) Fab-u-lous! Thank you so much, one of the best days I’ve spent. Enjoyed the sense of all the delegates improving through the day. Fun! Met a lot of really nice people. Improved my singing confidence and learnt some good advice on breathing, etc. Very efficiently run, excellent organisation. Fun. Help with breath control. Techniques to warm up. Surprised I was a bass! Lovely cake and warm welcome. A challenge as the bass section part was hard with few words. Gained confidence in singing with a large chorus. I loved it from start to finish. Lots and lots of enjoyment. Great organisation. Wonderful atmosphere. Thanks to all the ladies for a wonderful day. Enjoyed learning different singing techniques and breathing exercises. Thought FR members were very friendly and proficient/welcoming. Enjoyed practicing in different parts. Looking forward to singing with you again. The confidence to learn a complete song quickly and with natural choreography. Fantastic day – thank you! Looking forward to next year! Techniques, fun, friendship – exhilarating!! And Cake! Excellent info on voice use and control. Very friendly supportive coaches. Not made to feel inadequate, as never sung bass before. It involved lots of fun which helped relaxation. Overall inspired. Thoroughly enjoyed it all!! Fabulous. 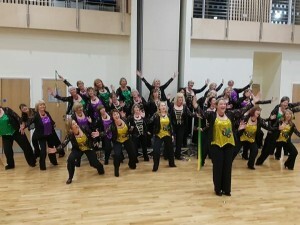 Singing in large 4 part harmony group! Breathing etc associated with singing!! Respect to Fascinating Rhythm!! Thank you. Above are just a few comments from the workshop evaluation forms completed by our 90+ delegates. Footnote: … FR had a great time too and are really looking forward to our next workshop on Saturday, 23rd January 2016 at Castle School.